Apathy is reigning over United at the moment. Whilst on tour in the United States of America drawing in two bland games, key players who had respectively successful World Cup campaigns for their national teams are missing and things are “really bad” according José Mourinho. Things do not look bright for the manager with the transfer window rumbling on and a severe lack of enthusiasm around the club – which he appears to not be trying to change with his latest borderline depressing comments. Some fans are calling for his head whilst others are backing him to the hill during this uneasy summer. However, there is one thing Mourinho could do that almost every single red would adore and put their faith into – this promising generation youth getting a real chance. With the Old Trafford men (and now possibly women too) having an outstanding record of blooding youth (with 13 of the 25 men on this pre-season tour being United academy graduates) and today’s game vastly being controlled by money, Mourinho can stray away from this crowd of modern, money-orientated managers by going down a route he has never fully gone down and turn around the football world’s perspective of him; by trusting young players and not making huge signings. This summer is the perfect opportunity for both players and Mourinho to turn this worrying few weeks into a historic period for the club. The likes of Timothy Fosu-Mensah and Andreas Pereira are definitely ready to play in first team matches with their very credible loan spells last season. Then comes Scott McTominay, Demitri Mitchell and Axel Tuanzabe who may not have had much loan experience but have looked mature beyond their respective ages whenever given the opportunity in the last 18 months or so. 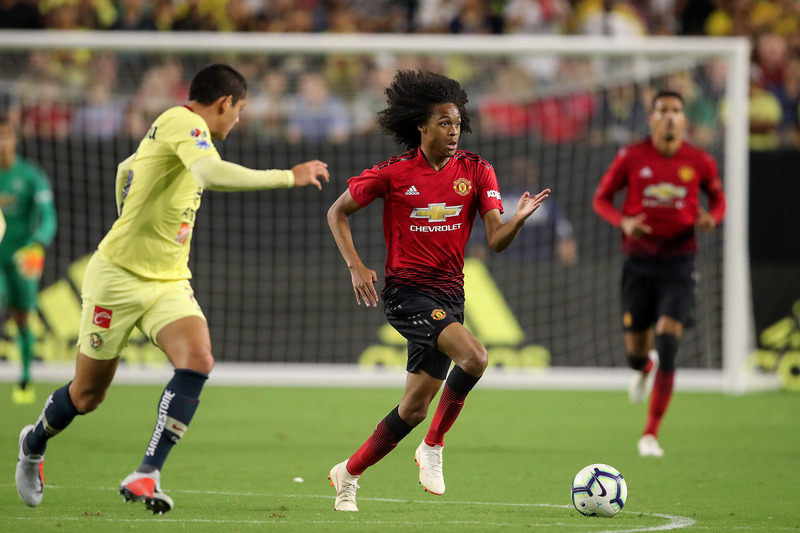 In addition to those, huge younger prospects like Josh Bohui, Tahith Chong, James Garner, Angel Gomes, Mason Greenwood, Ethan Hamilton and Ro-Shaun Williams have all come on tour and looked sharp, skilled, composed but most of all, hungry to impress their boss. Unfortunately, it seems two young goalkeepers in Dean Henderson (at Sheffield United for the campaign) and Joel Pereira (still to find a club but confirmed to be going out this year) have suffered from the usual Mourinho behaviour by going out on loan yet again. Whilst both would unlikely to stay at the club with Sergio Romero around, at least one could have stayed without Lee Grant coming in to play as third choice. No one knows the specific circumstances in the goalkeeping department but surely one youth man to play back-up to and learn from David De Gea and Romero would be useful. And that is exactly the problem with the Portuguese gaffer and is what upsets most United fans – because it is a typical Mourinho move; to make a likely unnecessary signing in place of giving youth a chance. A lot of fans would take another transition year if it meant youth were ready to make United a football powerhouse once again with that typical United mindset that the talented teens at the club have grown up knowing. We may never know if this crop of red talent is ready for first team action this upcoming hear but cup ties and some league games really open doors for those youngsters and Mourinho should be chauffeuring them through those opportunities. Part of his downfall at Chelsea almost three years ago was shoulder-shrugging thier golden generation of youth that seem to be still faulting even now. A long term project with not much money involved would be a significant change for Mourinho but would be a welcome one at this point. Losing his right-hand man in Rui Faria this year and now having Michael Carrick (someone who knows the true philosophy) at his side, the time might also be right. If Mourinho wants to get the fan base back on side and turn this frustrating situation into a truly galvanising time for the club by really using the “football heritage” that United have, then it is time for him to change and trust in youth.